Hanoi (VNA) - The Ministry of Education and Training will regulate specific floor marks for teacher training colleges and universities from 2018 as part of measures to improve teacher training quality. Floor mark is the minimum mark Vietnamese students must obtain from national exams to be eligible to study at any university or college. The move was made after a number of teacher training colleges and universities in Vietnam pushed cut-off marks to a record low to enroll enough students. Some institutions even lowered their pass marks to nine out of 30. 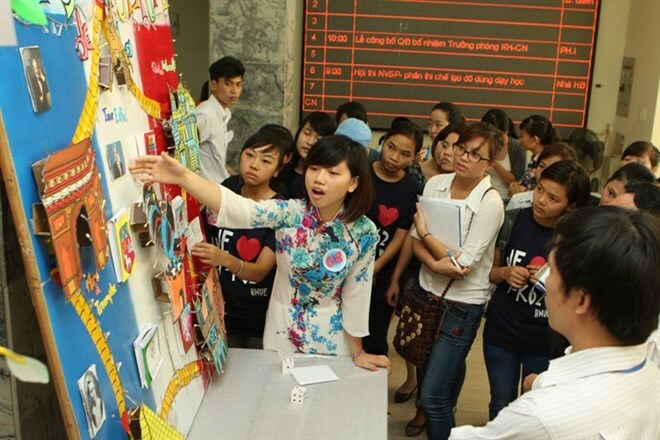 Vietnamese 12th graders took the national exam in June with separate tests in math, literature, English and basic sciences. Their total scores in three of these tests are used to determine which university or college, if any, will accept them. The new regulation was revealed by Minister of Education and Training Phung Xuan Nha at a working session with rectors of teacher training institutions nationwide on August 16. This regulation is quite unique as the ministry had previously decided to not set general floor marks for all universities and colleges from 2018 but let them decide their own pass marks. Participants at the meeting said among the key reasons leading to the low benchmark was that the number of pedagogical institutions exceeded the real demand, due to which many institutions failed to enroll enough students. The high rate of unemployment among teachers was another reason. Every year, some 4,000 students who graduated from teaching schools were unable to find a job, and the surplus was expected to reach 70,000 by 2020. In addition, the low salaries paid to teachers in the country demotivated students from enrolling in teacher training institutions. Admitting shortcomings in teacher training, Minister Nha stressed that resolute measures were needed to improve training quality, focusing on quality of students at teacher training institutions. He also requested that training be closely linked with real market demand. In particular, training of teachers in teaching fields that are redundant must be stopped. He said the ministry would increase inspection of training quality of teacher training institutions and speed up reorganisation of the network of teacher training facilities. The ministry would also improve research and provide consultancy to the Government and the National Assembly to have better policies for teachers. At a working session with the Ministry of Education and Training on August 17, Deputy Prime Minister Vu Duc Dam asked the ministry to actively implement a plan to “place an order” with teacher training institutions to ensure employment for graduates and training quality. Once the plan is implemented, problems relating to pass marks at teacher training institutions could be resolved, he said. “Qualified output is a decisive factor. We have shortcomings in not assessing real market demand for human resources of the pedagogical sector, leading to surplus of teachers in some areas but shortage of teachers in other areas,” he said. Teacher played a decisive role in the development of education, he said. He admitted that a number of teachers are qualified, but there were those not qualified, thus failing to meet the demand for education reform. One key reason leading to the problem was the quality of teachers training at pedagogical institutions. Minister Nha said the ministry would pay more attention to assessing real demand for teachers in each sector.